Senior Communist Party of China (CPC) official Wang Huning on Tuesday announced the launch of a new learning platform. It was considered a key measure to push for learning Xi Jinping Thought on Socialism with Chinese Characteristics for a New Era. 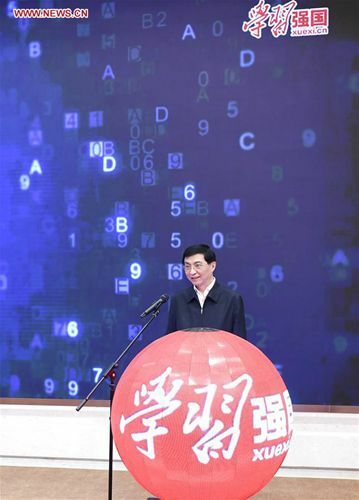 Wang, a member of the Standing Committee of the Political Bureau of the CPC Central Committee and a member of the Secretariat of the CPC Central Committee, attended the platform's launching ceremony. Huang Kunming, a member of the Political Bureau of the CPC Central Committee and head of the Publicity Department of the CPC Central Committee, said Xi's important thoughts on reform, development, stability, domestic affairs, diplomacy, national defense, as well as governance over the Party, state and military should be fully demonstrated on the platform. Addressing the ceremony, Huang called for efforts to build the platform into a comprehensive and resourceful database for learning and communicating Xi Jinping Thought on Socialism with Chinese Characteristics for a New Era. Users can log in to the platform through website xuexi.cn or the mobile phone app, where they have free access to a great number of journals, ancient archives, open courses, songs, operas, movies and books.